In the previous post, I explained the basic to trade with Elliott Wave Principle, which explains the behavior of financial market and applied in financial market forecasting and trading. This post explains the way to level the Elliott's impulsive five waves and corrective three waves. Leveling the impulsive and corrective waves both in bearish and bullish market is explained. 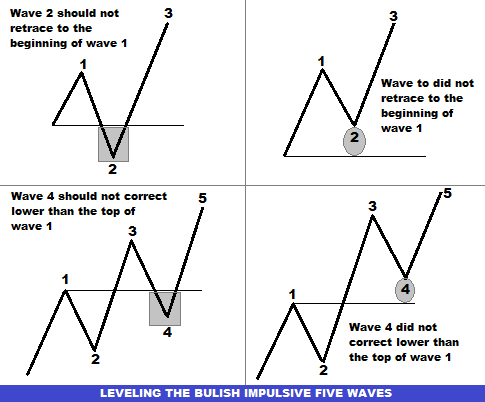 In the above illustration, the way to level the impulsive five waves in a bullish market is explained. The remarkable principles in leveling the impulsive five waves in a bullish market are as follows. The wave 2 should not retrace to the beginning of wave 1. The wave 4 should not correct more than the top of wave 1. According to the aforementioned principles, if in a bullish market a certain wave 2 is retraced to the beginning of a wave 1, then the wave will not be leveled as wave 2, and if the wave 4 correct more than the top of wave 1, then the wave will not be leveled as wave 4. In the above image, the way to level the impulsive five waves in a bearish market is explained. 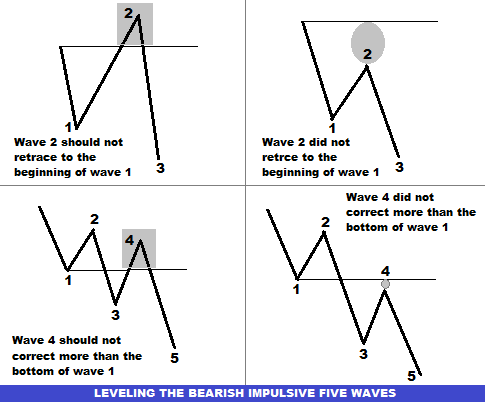 The core principles to level the impulsive five waves in a bearish market are as follows. The wave 4 should not correct more than the bottom of wave 1. Any alteration in the aforementioned four principles can cause ineffective wave analysis. In case of corrective three waves, the rules are not that specific indeed. General rule is that the corrective b wave should not correct more than the beginning of wave 1.But this rule only expected to be true when five impulsive waves are successfully completed, and alteration of this rule is very common in real time market. Above image explains the case in a bullish market. The way to level the corrective three waves in a bearish market are illustrated in the above image. Every traders must focus on the correct leveling of impulsive and corrective waves. Incorrect leveling can cause failure of wave analysis. Leveling the waves during wave analysis is not as easy as explained because the real time price charts are really complex. Most of the new traders find it very difficult to level the waves to conduct an analysis. To conduct a successful analysis, the principles of leveling waves must be focused. Thanks for sharing your trading experience wit us. The importance of WAVES explained very well. Also nice tips for beginner. The foreign exchange market enables different types of buyers and sellers to trade through financial centres around the world, around the clock during weekdays. Amazing article over online Forex trading, which is considered as one of the emerging business trends, nowadays.